Principal Cast : Gary Cooper, Marlene Dietrich, Adolphe Menjou, Ullrich Haupt, Francis McDonald, Eve Southern, Paul Porcase, Emil Chautard, Juliette Compton, Albert Conti. Synopsis: A cabaret singer and a Legionnaire fall in love, but their relationship is complicated by the results of his womanizing and due to the appearance of a rich man who wants her for himself. 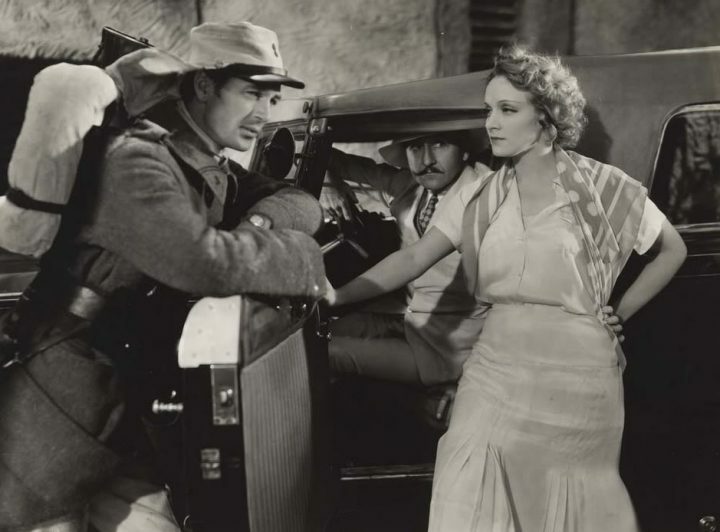 Nominated for four Academy Awards (including Best Director and Best Actress), Josef von Sternberg’s 1930 romantic drama Morocco made actress Marlene Dietrich a breakout star and household name, and solidified the rising status of noted Hollywood leading man Gary Cooper. Featuring a (then) controversial female-to-female kiss and Dietrich singing a song in a man’s suit, Morocco’s evocation of the exotic nature of that far flung country and the amorphous pansexuality of its star remains a sizzling example of pre-code storytelling that makes for compelling viewing. Nightclub singer Amy Jolly (Dietrich – Dishonored, The Scarlet Empress) lands in Morocco searching for purpose. A French Legionnaire, Tom Brown (Cooper – High Noon), returning from a campaign with his fellow soldiers, meets the singer at a club where she is the headline act, and immediately is drawn to he beauty. 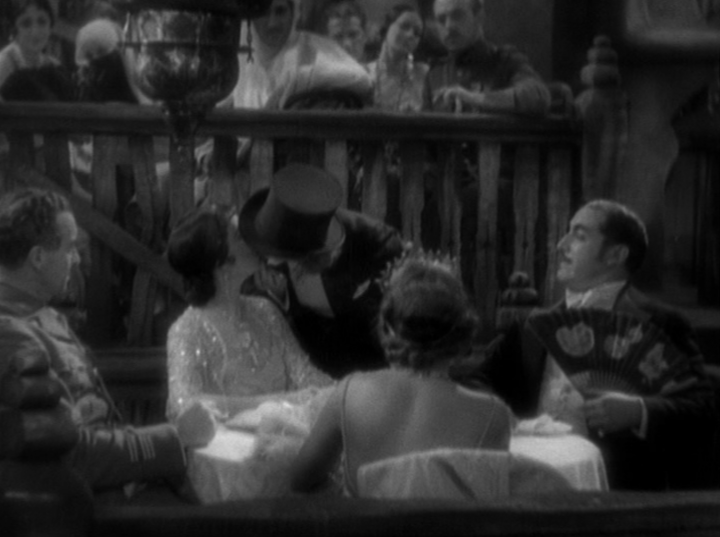 Also at the nightclub is wealthy Kennington La Bessiere (Adolphe Menjou – A Woman Of Paris), who attempts to woo the woman despite her obvious attraction to another man. As Tom’s duty to his legion conflicts with his passion for Amy, and their love remains strong despite being apart, events conspire to destroy their lives together. Tragic love is the focus of Morocco, a withering romantic melodrama by Sternberg based on the novel “Amy Jolly” by Benno Vigny; the relationship between Cooper’s Tom Brown and Dietrich’s Amy Jolly comes across as a little like that between Casablanca’s Bogart and Bergman – fated to fail simply through coincidence and social constraints – while the additional attraction of Menjou’s Le Bessiere, himself not an entirely unwilling participant, and Eve Southern’s Madame Caesar, who has a previous physical relationship with Brown that strains his newfound love with Amy, provide contrast between the core characters in their participatory aspects to the plot. Incendiary sexuality on the big screen was largely taboo at the time of Morocco’s 1930 release, and certainly the film caused quite a stir for its celebrated all-female lip-lock during an early musical number, but by today’s standards the film is fairly pedestrian in comparison. Cooper and Dietrich’s characters are drawn to each other out of some kind of melancholy desire for admiration and attraction, a sense of destitute depth and resigned commodification of their emotional attachments. Ill-fated lovers are dime-a-dozen in Hollywood’s long history, and Morocco’s Tom Brown and Amy Jolly are early proponents of the best kind. Adolphe Menjou’s role is of the unrequited admirer, forever cast to look upon his love from afar and never attain that which he desires most, and in my opinion it’s his role that makes Morocco’s melancholy underpinnings work so well. Support roles to Ullrich Haupt, as the husband of one of Tom Brown’s former conquests, and Paul Porcasi as the nighclub owner around which Amy Jolly’s flirtations occur, are mere window dressing to the main act, and both Cooper and Deitrich – they reportedly didn’t get along during production – have terrific chemistry together. Cliched, maybe a touch, but the film’s nature of contrasting interests between the central characters is its strongest element, and thanks to a brisk screenplay by Jules Furthman (who would later work on Mutiny On The Bounty, The Big Sleep and Rio Bravo) really evokes a time and place audiences could be swept up by. Dietrich’s usurpation of sexuality in the film’s early moments, where she dresses up in men’s tophat-and-tails and kisses another woman on the lips, is intriguing to say the least, and her raw femininity during the majority of the movie’s more melodramatic moments is astutely sexual. Cooper’s lanky charisma leeches from the screen as well, never shirking his lovelorn act and yet remaining defiantly masculine; it’s a delicate balance between aloof and distantly sad, but he pulls it off. The dialogue between Dietrich and Cooper is scintillating and filled with meaning despite saying little, and there are lines within the film that are roundly provocative and portentous. Furthman’s operatic play with double entendre and innuendo is subtle yet obvious, maximised by Dietrich’s sensual performance and cinematographer Lee Garmes’ potent framing. Amy Jolly: Every time a man has helped me, there has been a price. What’s yours? 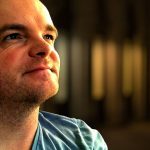 La Bessiere: My price? A smile. Amy Jolly: I haven’t got much more. Although set in the North African country, Morocco was filmed primarily in California, and the set design by Academy Award nominee Hans Dreier (he would lose to Max Ree for Cimarron) is simply gorgeous. The photography by Lee Garmes maximises the use of the sets and captures the radiance of Dietrich with ease, although von Sternberg apparently decided to shoot a lot of Cooper’s takes from a higher angle, repudiating his feelings for the actor (Cooper also didn’t get along with his director) and cast his leading lady in a far better light. Critics better than I have noted that La Bessier appears somewhat similar to the style and manner of von Sternberg himself, perhaps autobiographically contextualising the director’s own relationship with Dietrich subliminally as a forlorn, never-to-attain infatuation. 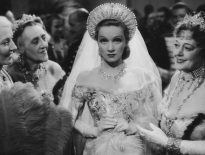 This perspective brings a sense of hollow sentimentalism to the character, bolstering the Cooper-Dietrich angle and confining the cuckolded La Bussier to a tragic, emasculated conclusion. 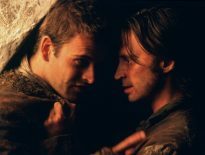 Morocco is a superbly acted, well directed romantic triangle of heat – heat in the land and heat between the characters. Dietrich sizzles as Amy Jolly (deservedly snagging an Oscar nomination for the part), Cooper is solidly wonderful as Brown, and Adolphe Menjou rigidly amenable as the third leg in this intrinsically doomed love story. It’s frothy nonsense at the heart, but compelling performances, a withering screenplay and above-average direction from Josef von Sternberg maximises the best aspects of the production, providing some terrific moments of humanism and introspection that even modern audiences will appreciate. The heat coming off the screen whenever Dietrich is on it is tangible here, that much is certain. Morocco is a desert delight of the first order. Now this one sounds good, I’ll have to give it a watch. Worth it for some of the ripe dialogue alone. A cracker, despite its technically limited production values.